Flint is now available for purchase as an individual pattern. The pattern includes all the usual charts and line by line instructions as well as, links to video instructions, tips to customize your sweater, and suggestions to help make your knitting go a little smoother. Flint is worked top down and is knit to fit. The pattern gets you started with specific stitch numbers and includes lots of tips for getting the proper fit. After that most instructions are intentionally given without specific stitch numbers. You decide when to stop making increases and when to start the next section so your sweater fits you exactly the way you like. 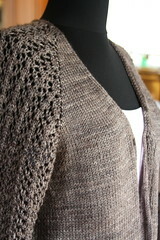 Flint is interesting to knit, totally wearable and full of details. The sewn hem adds a little weight at the bottom and sleeves, helps the sweater lay flat and looks perfect inside and out. 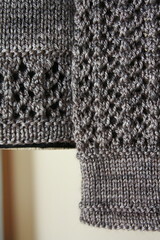 The stockinette cuff finishes the sleeve with style and ensures you don’t have any flaring. 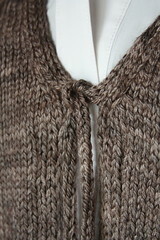 Even the front borders look great on both sides so your sweater can hang open and no one will know it’s a hand knit. I want you to not only love your sweater, but the process of making it. When you put that much time and money into a project, I think you should have a good time making it and be proud as heck to wear the finish product. To help achieve those goals I’ve improved the pattern layout and readability, created video tutorials, included a full page of tips and suggestions and added full color close up photos. You can also join the KAL to get help, show off your progress or just see what everyone else is doing. 2 sets US size 4 / 3.5 mm circular needles, 27 inches or longer, or size needed to obtain gauge. 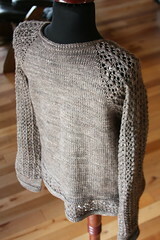 Flint is the first pattern in the Sweater for all Seasons Club. If you like this sweater and think you might like similar patterns you can get all the club details here. P.S. I’ll post the winning name for SFAS #2 tomorrow morning. You guys really rocked the contest! So many great choices!